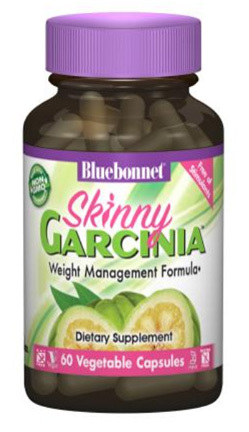 Skinny Garcinia, 60 Veg Capsules (Bluebonnet) - Penn Herb Co. Ltd.
Bluebonnet’s Skinny Garcinia Vegetable Capsules are specially formulated with the patented South Asian fruit extract, Garcinia cambogia, known as Super CitriMax; that is standardized to 60% [750 mg] hydroxycitric acid (HCA). This combination formula also contains L-carnitine, chromium, choline, inositol, vitamin B6, methionine, plus important electrolytes. As a dietary supplement, take three capsules once daily, preferably with a meal, or as directed by a healthcare practitioner.